To him, it’s not just a story about technology either. “It’s also the social and economic history of this place; the story of a remote Navy outpost, carved out of King George County marshes and farms in 1918, that went on to become the nation’s, and the world’s, most important ordnance testing facility, and then so much more,” says Jones. 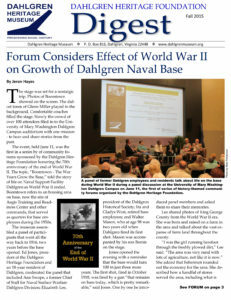 Coincidentally with a groundswell of community interest in a Dahlgren museum, the largest command on the base, Naval Surface Warfare Center Dahlgren Division, had already begun a project to collect and archive important documents and artifacts related to the command’s history, which is rooted in the base’s founding as the Naval Proving Ground in 1918. Officials from the Navy Heritage and History Command also participated, and added their endorsement to the idea of establishing a museum at Dahlgren that would showcase an important part of Navy history that isn’t captured in other museums. “The enthusiasm in that meeting was pretty remarkable,”adds Wagner, and through the course of a number of follow-on discussions, momentum for the initiative has continued to build as a group of community leaders has worked to develop an organization to run the museum. A board of directors organized in July, with Jones appointed as president, and the group’s application to incorporate the Dahlgren Heritage Foundation was accepted by the Virginia State Corporation Commission in August. The board of directors will continue meetings with the Navy over the next few months to develop support agreements. “An important next step for us in the near future,”adds Jones, “will be for us to reach out to others in the community who might be interested in serving on an advisory board. “We’ll be looking for folks who can support this initiative in a number of ways, drawing on their expertise in multiple areas,” said Jones. Members of the board of directors for the Dahlgren Heritage Foundation presently include Johnny B. Ashton, a King George native with an international business and a passion for area history; Jim Colvard, former technical director of the Naval Surface Warfare Center Dahlgren Division; Ruth Herrink, publisher for Journal Press, Inc. in King George; Elizabeth Lee of the King George Historical Society; retired Navy Capt. Joseph McGettigan of King George, a former commander of NSWCDD; John Mitchell, a businessman who has been active in battlefield preservation in the area; Stan Palivoda, a King George businessman and realtor with a passion for history; Lisa Rossbacher, a Dahlgren School graduate and currently president of Southern Polytechnic State University in Marietta, Ga.; Elmore Tyler, who has been active in many history projects in King George County; and Ed Watson, president emeritus of the Fredericksburg Area Museum and Cultural Center.